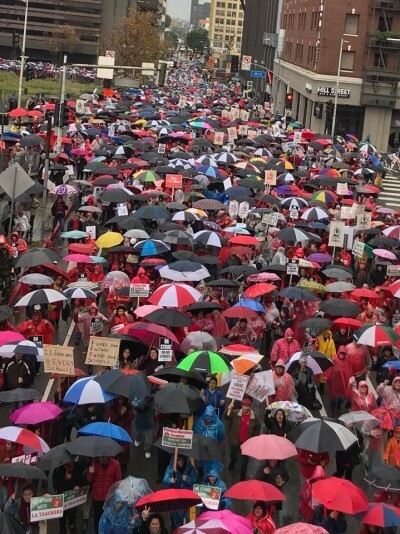 Due to the actions of teachers across the country last year, especially in Oklahoma, West Virginia, and Kentucky, many have called 2018 “The Year Of The Teacher.” But 2019 might just see a wave of “Red For Ed,” as teachers in one of the largest school districts stage a significant strike involving over 30,000 educators, serving 640,000 students. 1. This strike did not happen quickly or recklessly. District officials are claiming that the teacher demands will bankrupt the system. 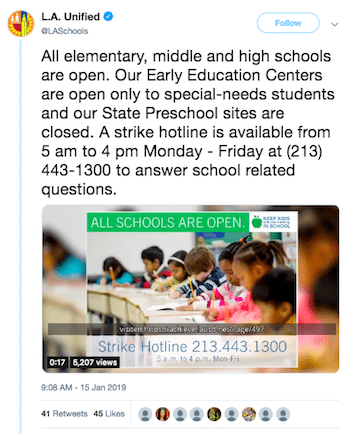 The superintendent of the Los Angeles Unified School District, Austin Beutner, actually penned an opinion piece in the Wall Stree Journal, entitled L.A. Schools Have A Math Problem, where he defends the district and explains insolvency and a possible state takeover. But remember, Los Angeles exists in an area of our country where billionaires, business moguls, and entertainment stars live in mansions. L.A. teachers are requesting a living wage and reasonable support for students such as nurses and librarians. 2. Money is an issue, but salaries are only one layer. The average salary of a Unified Los Angeles teacher is $75,000, far higher than the national average which hovers around $59,000. However, the cost of living in Los Angeles is extremely high. Currently, the district has offered a 6 percent raise, which would raise the average salary to $79, 500, still significantly lower than the $88,000 average salary for teachers in New York City. The LA strike, and for that matter all of the teacher strikes concerning compensation, have one significant phenomenon in common: the rise in the privatization of education. The divestment in public education has been persistent in the last thirty years and is directly demonstrated by parents with means consistently enrolling their children in private schools. In cities across the country like in Sacramento, CA and Baton Rouge, LA many people, who themselves benefitted from public education in places like New York State, refuse to send their children to public schools. Public education in many locales has become the last resort for the middle and upper classes, thus perpetuating the myth of the “dirty publics.” In essence, there has been white flight not only from urban areas but also from public education. This refusal to support “other people’s children,” and the concentration on the perceived “best” schools for middle and upper-class students have created savage inequalities that will only increase the disparity. The current Secretary of Education, Betsy Devos, is an advocate of “school choice,” a term that typically means parents are not choosing public education. However, the past Secretary of Education, Arne Duncan, forced public institutions to “Race to the Top,” with the carrot of increased funding. George W. Bush’s administration wanted “No Child Left Behind,” and the Reagan years declared “A Nation At Risk.” For over thirty years, teachers have been told they need to perform better but are never given enough resources to meet even the basic needs of their students. 3. Class size and support staff matter. Currently, the students in Los Angeles County Schools are learning in classrooms with over forty students. Forty is much larger than eighteen. How are students well served in a classroom with over thirty students? What about students with special or medical needs? How can a school be called a school without a librarian? Many schools in L.A. County do not have a dedicated librarian. Many schools have part-time nurses. L.A. County Schools are also short on school counselors and special education assistants. Public schools are vibrant locations with diverse needs. Although the Los Angeles Unified School District covers a vast area, The New York Times attests that “It is overwhelmingly low income; more than 80 percent of students qualify for free or reduced-price lunch. And Latinos make up roughly 75 percent of all students, while whites and African-Americans each account for less than 10 percent of enrollment.” The Los Angeles teachers are striking for their students, a mostly marginalized group who lack representation and opportunities. 4. Some L.A. Students are still attending school. Although many students are not attending school during the strike, the Los Angeles School District is reporting that substitutes and administrators are teaching classes. The superintendent, Austin Beutner, a former investment banker turned politician with no education experience, claims that learning is still occurring. With no quick resolution in sight, it will be interesting to see if the administration appreciates the challenges faced by employees. 5. L.A.’s distinctions are significant. 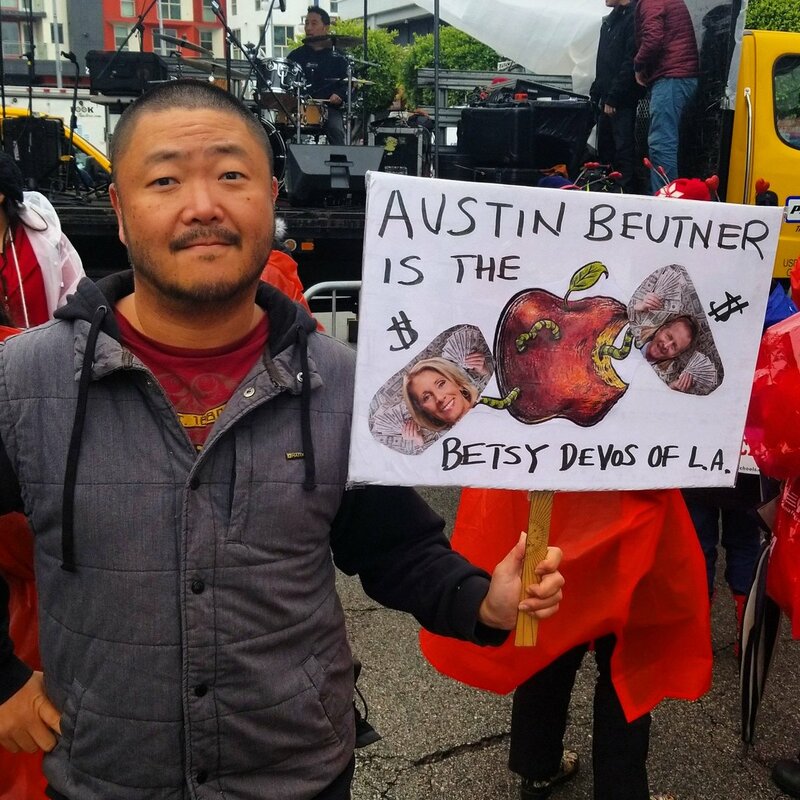 Los Angeles teachers are striking against their employer, the Los Angeles County School District and its superintendent, Austin Beutner. This strike is a product of a collective bargaining stalemate. In Oklahoma, West Virginia, and Kentucky, teachers marched to their state’s capital–the location of funding and mandates. Los Angeles teachers are out on the street in front of their schools. Furthermore, in many states teachers have no right to union membership nor collective bargaining. These teachers are at the whim of state leaders. People in Oklahoma, West Virginia and Kentucky, typically “red” states, overwhelming supported teacher salary increases. Popular support was crucial to their victories, but without union solidarity, their gains are tenuous. The future of public education is at stake. The Los Angeles teachers represent a large contingent who are shining a spotlight on the cracks in the public education system. These cracks expose not only many local school districts’ issues but our collective problems with inequality in America. Blume, Howard, Kohli, Sonali and Fry, Hannah. “Only about a third of LAUSD students attended school on the first day of teachers’ strike.” Los Angeles Times. January 14, 2019. Chavira, Adriana. “Opinion: Charter schools are draining LA’s public schools. That’s why I’m on strike.” PBS News Hour. January 14, 2015. Medina, Jennifer, Arango, Tim and Goldstein, Dana. “Los Angeles Teachers Strike, Disrupting Classes for 500,000 Students.” New York Times. January 14, 2019.